The legendary Perry Roubaix in Perry, GA is an iconic road race in the south consisting of short, steep-pitched hills along with long, narrow, and dangerous dirt roads that took place over the weekend. A 75° fahrenheight day with little to no wind and blue skies greeted the racers this year for a great day of racing. Several big teams toed the starting line this year including Kenda Five-Hour Energy, Lupus Racing, Novo Nordisk, Lightspeed BMW, and Mission Source. The 706 project’s very own Alexi Schmidt was able to make the first break of 6 riders. Kenda and Lightspeed missed out on the move however and were chasing vigorously to pull back the six-man group. After nearly 30 miles of racing, the break was caught. 706's Fletcher Lydick and David Goodman were anxiously waiting their chance to attack the field. As soon as the field caught the break, the duo started attacking the field until a small group of ten riders including Goodman eventually got away. . With three miles remaing, the 10-man break was still clear of the rest of the field. With less than a mile to the finish, all the riders started looking around, anticipating who was going to lead it out for the bunch sprint. Goodman decided to give it a go from about a kilometer out. 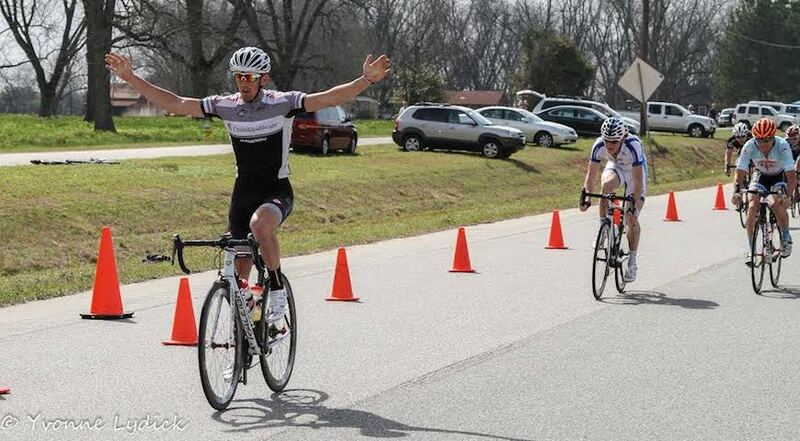 He dropped his head and buried himself all the way to the finish line, where he held on to the win by a bike’s length. David Goodman taking the win!